Paulette should know. His home is downstream from Canada’s vast tar sands mines, and he has seen high rates of unusual cancers plague the local indigenous communities. He now fears the same will happen in Utah, where the first U.S. tar sands mine may open later this year. That is why Paulette came to Salt Lake City to share his years of firsthand experience working to stop the tar sands mines of Athabasca with the soon-to-be impacted communities of Utah. The event at the capitol building was organized under the banner of the Idle No More movement, which sprang into action in Canada several months ago as a response to the Harper government’s continued abuse of indigenous rights and environmental protections. Holding flash mobs where people drum, dance and sing has become the movement’s signature form of protest, spreading the call for indigenous rights around the world in the process. Through Idle No More, many of the communities experiencing the most extreme environmental injustice are demanding their rights be recognized and upheld. While many indigenous communities have never relented in this struggle, Idle No More has amplified the environmental justice movement’s voice and attracted more participants. 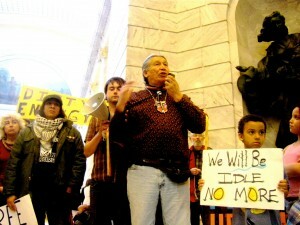 This movement could not have come at a more urgent time for the indigenous nations of Utah. Tar sands and tar shale deposits overlap the Uintah and Ouray reservation, and the site of the first prospective mine is just several miles east of the reservation. Furthermore, the Green River will bring toxins downstream, and eventually to the Colorado River, which supports 30 million people and is used for irrigation on four million acres of farmland. It’s precisely this sort of injustice, to both people and land, that led Paulette to enter politics and activism at an early age. In 1971 — just two years after becoming the youngest-ever Dene chief, at the age of 21 — he fought a legal battle to prove that the Dene people had never ceded rights to their land. The Canadian Supreme Court’s decision resulted in the Paulette Caveat, affirming that the Dene had never given away their land rights, which led to a surge of indigenous land claims. Paulette has also served as vice chief of the Dene Nation and commissioner of the Assembly of First Nations — a national body composed of 630 First Nations — using his political sway to stand up for treaty rights and to urge governments to retract support from projects like the Canadian tar sands and the Keystone XL pipeline. In addition to the work of halting environmental destruction and healing the earth, Paulette also works to heal bodies. At the largest hospital in northern Canada, he helps doctors incorporate indigenous ceremonies into medicine. Improving the hospital is particularly important to Paulette because many of his family members and friends suffer from cancer caused by the tar sands mining on the tribal land. 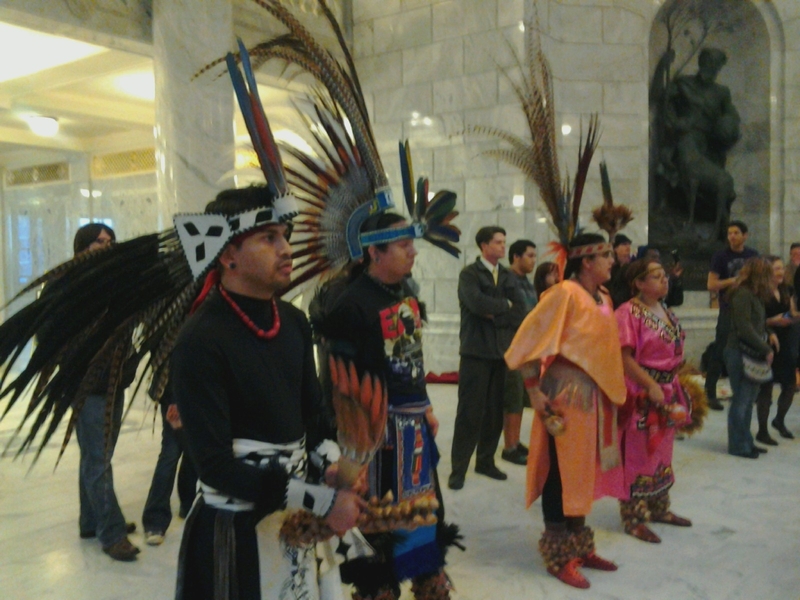 While in Utah, Paulette spoke to members of the Ute tribe about the troubles they may soon be facing. Many people had not heard about the plans to mine, but they were receptive and eager to learn about the effects of tar sands mining on his community. Despite the oppression his people have endured from the Canadian government for many years, Paulette is optimistic about the effectiveness of political pressure. He says that if people are organized and speak with a unified voice, they can win their demands. 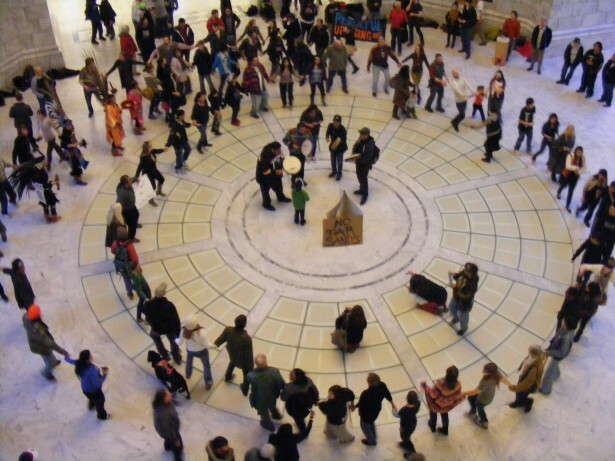 The round dance at the state Capitol was a step toward this vision. 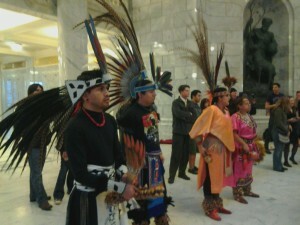 Not only did indigenous and non-indigenous Utahns take part, but so did a group of indigenous Mexican dancers, dressed in colorful regalia. In so doing, Idle No More’s round dances may help build numbers and momentum for the movement. The celebratory energy of the dances and the practice of asserting group power in public places builds community, and this unity is ultimately what is needed if people are going to harness their ability to stop devastating projects like tar sands mining. The effects of such an awareness can already be seen in western Canada, where indigenous communities have demonstrated a formidable power through their solidarity against the Northern Gateway pipeline, which Enbridge aimed to build through British Columbia. The Yinka-Dene Alliance organized the signing of the Save the Fraser Declaration, which over 130 First Nations have signed, telling Enbridge it will not pass through their land. The militant stance many First Nations and their leaders have taken against the pipeline has stalled the process significantly, if not made it impossible to proceed. Non-indigenous allies might take a lesson from this success, particularly by recognizing the importance of communities. Too often the focus is on individuals who seem powerless to stop a major industrial project. If a powerful resistance against tar sands mining is to take hold in Utah, it’s going to require a mass effort that includes solidarity between indigenous and non-indigenous communities. Thanks for this beautiful piece, Melanie. This type of power-through-dance action sounds like something that we should consider in NYC for May Day…. I love the song, leaves a big lump in my throat with pride and hope, beautiful song and awesome singers. I am from the Blood Tribe, part of the Blackfoot Confederacy and my father is well known throughout the Powwow Trail for his songs. This song touches my soul and I am wondering what the song is called. I can’t wait to show this clip to my brothers and nephew, to ask if they know the song or if they recognize the singers. Any info is appreciated. Love and prayers from Blood Tribe. Except that the indigenous of The USA support and back the pipeline, quite unlike those Asian pretenders of the British colonial government occupying Canada who are only protesting the pipeline to stick it to indigenous America. Washington won, remember, and British Canada lost bigtime. This is just another play against indigenous America by the transoceanic enemy.